Alcatel has sprung something of a surprise by releasing an Android phone when it's so traditionally ploughing the bottom end of the market. 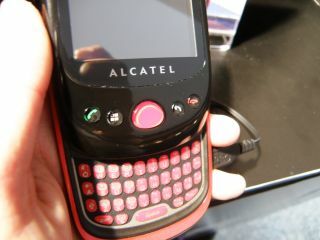 In fact, we were so surprised by its presence that we didn't get to see the full Alcatel Android experience - we were only able to get hooked up to a dummy model. The phone feels pretty plasticky and flimsy in the hand - much like you'd expect with a budget Android offering. There's a full QWERTY keyboard in portrait mode - we might start calling this the Pre's long lost, poorer cousin. The buttons on the front actually have a decent enough travel, although they're jolly hard to hit. It's not the most flattering of phone chassis you'll ever see, and it's not the most pocket friendly either. However, it is packing all the power of Android 1.6 and 2.1 (we're not sure if this is an upgrade strategy or telling us there will be two different models. There's a camera on the back, as mandated by the Open Handset Alliance who helped created Android with Google. The spec sheet is here for all to see - just don't go getting excited about a phone that could cost less than £150 over here.